During the first half of 2010, Skat provided advisory services to the Sphere Handbook revision for the 2010 edition. The services included improving the quality of key indicators to show whether the minimum standards in humanitarian work have been attained. The key indicators provide a way of measuring and communicating processes and results of key actions. Skat has been commissioned to provide advice in the development of key indicators of the 2010 edition of the SPHERE Handbook. In addition, Skat supports in the formulation of a working definition of ‘indicators’ and in the assessment of key indicators based on their measurability and the degree to which they reflect whether a Sphere standard has been attained. Key indicators have to fulfil the SMART criteria and consistency between process, outcome and impact indicators in the areas of Common Standards, WASH Food Aid, Shelter / Non-Food Items and Health Services have to be assured. The Sphere Handbook is designed for use in disaster response, preparedness and humanitarian advocacy. 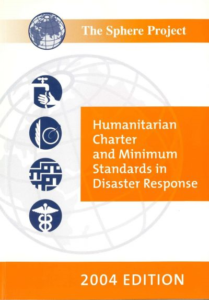 The purpose of the handbook’s revision is to update the qualitative and quantitative indicators and guidance notes as needed, enhance linkages between sectors, take into account latest developments in the sectors and make necessary relevant additions leading to a consensus on the new edition of 2010.